May Wrap-Up & a Personal Catch Up! Hi everyone! For me, May was pretty rubbish and there will be more about that later. I’m very glad to see June: the summer term begins, I have some nice plans ahead and it’s also my birthday month. All in all it’s looking up, finally. Ah, this book was SUCH an exhilarating adventure. 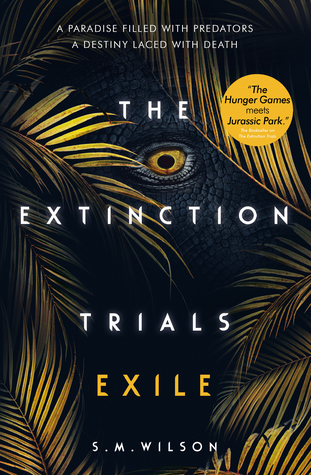 I adored the first book in The Extinction Trials series and Exile certainly provided just as much excitement and adventure as book one, maybe even more. I loved being back in the company of Storm and Lincoln, traipsing through the glorious yet dangerous landscapes of Piloria knowing there are dinosaurs around every corner. I adore these books and seriously cannot wait for book three. I was also super honoured to be mentioned in the acknowledgements of this book, which was a huge first for me! If you like dinosaurs and YA, you MUST read these books! If you are one of the lovely people who reads my blog regularly or follows me on Twitter, you’ll know that recently I took a step away from it all. May was a really bumpy month for me for a couple of reasons and I’m only now feeling really up to getting back on my blogging horse again, so to speak. I started off the month of May feeling really out of it when it came to work. Although I wasn’t struggling (remember I started a new post two months ago), I found myself having a huge crisis in confidence. Despite knowing logically that I was on top of everything, that things were going well and people had praised me for my job, my silly brain just kept telling me that I couldn’t do it and that I wasn’t coping. I found myself feeling extremely stressed and just not enjoying my job at all, which is very unusual for me. This all built up and one morning I had a big old cry to two of my work friends about it, two people who are also in positions in work to make a difference. They hugged me, we had cups of tea and we had a long chat. I was reassured that I’m actually doing a brilliant job and after quite the discussion, I realised that actually I’m just too hard on myself (who knew?!). In the last two months I have done the following: moved buildings, left my closest work support system (due to building move), started a new and very crucial role, lost my classroom – there’s only so much change one person can take, especially me! After talking it through I realised that I am actually doing okay, I think I just needed some reassurance. My colleagues have been wonderful too, making sure I’m feeling okay and just giving me those little words of encouragement that we all need every now and then. Just as that was then getting back on track and everything was feeling fine again, a huge tragedy struck our school community. I cannot go into detail about it but it’s one that hit very close to home. Grief is a horrible thing. Something that consumes us when it’s fully present and creeps up on us when we are not expecting it to. It sits in the back of our minds and rears its ugly head with each new loss we experience. This is our second bereavement as a school this year and it’s been truly awful. Our pupils are the absolute best, they inspire us all. We are lucky to have had a brilliant lady coming into our school for bereavement counselling and this time I was told I needed to attend and, actually, that was probably the best thing for me despite my initial reluctance. As school closed for half term towards the end of May things were starting to feel okay again. As a teacher you never expect to lose pupils, it has been very difficult for all of us, especially the pupils. But as a team we are all stronger for it and we’ll never forget them. Moving into half term and those last few days of May I really made sure that I took time for myself. I have read a lot, I’ve started to blog again and I’ve set up my bullet journal for a new month. I’m finally feeling ‘me‘ again. ← Six for Sunday | Rainbow Books! I read Exile too this month and absolutely loved it! I enjoyed how exciting it was and the return to the Island and seeing Storm again. Glad that you took the time you needed and that you are feeling better now. I’m glad you loved Upside!! It’s such an adorable book 💕 And thanks for bringing The Extinction Trials to my attention!! I’m such a huge Dinosaur nerd and I’ve always wished they were part of YA more. This sounds awesome!! Really sorry to hear that you haven’t been feeling the best and about the loss at your school 💖💖 I hope June is so much better for you!! I have wanted to read It Only Happens in the Movies, do you recommend? Sorry May wasn’t great but I hope June treats you a bit better! I am so glad that you took the time you needed and are feeling a little better. We missed you in the blogging community! As for your wrap-up, I haven’t read any of these titles, but you’re book of the month looks super interesting! May have to add to my TBR!